Fee simple 90 ft boat slips for sale by the owner in a deep water and well protected charming Marina mid point between Ft Lauderdale and Miami on the ICW. Fastest route to the ocean is approximately 25 minutes south to Bakers Haulover inlet, but sail boats with over 32ft clearance head north to the Ft Lauderdale exit approximately 50 minutes away. Large Slips are scarce in Florida and owning your own dock is not only a good investment but a guarantee of safe dockage free from rising rents and scarcity. Full time living onboard is not permitted but shorter terms stays, vacations and crew are allowed. Adjacent facilities include a LA Fitness gym, a mini-market, post-office, several restaurants, an outdoor cafe and a handful of boutiques. 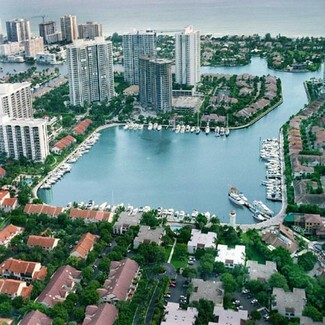 Ft Lauderdale and Miami international airports are 20 minutes drive and the Bahamas are just 44 miles across the water. Ideal for boats 60ft-90ft and up to 20ft beam. Sale Price: $395,000 Mostly listings charge by "Flat Rate" per month.